The SCM1100 is a Single Channel Monitor for vibration monitoring utilizing the Riverhawk A1 seismic sensor. It is a direct replacement for the older V/P-T3, VT-11A, and Series 2000 TriLight products. Through the interconnecting cable, the A1 sensor receives an excitation signal from the monitor and in turn provides an output back to the monitor. The monitor processes, filters, conditions, measures and displays the signal. Vibration is measured as displacement and displayed as a peak-to-peak amplitude value on the graphical LCD. The SCM1100 has many parameters that can be modified to vary the operation of the unit. These parameters are configured at the factory to meet the specific needs of the customer. Should parameters need to be varied in the field to better suit the characteristics of the operating environment, such as the level of vibration being monitored, the amount of instantaneous variation in the vibration, or more appropriate actuation or reset delays, changes can easily be made in the field by using a laptop computer and a simple PC application. The SCM1100 is a sophisticated product utilizing a single board computer and capable graphical display. Besides the configurability through the software and many parameters, it has a lot of hardware capability as well. 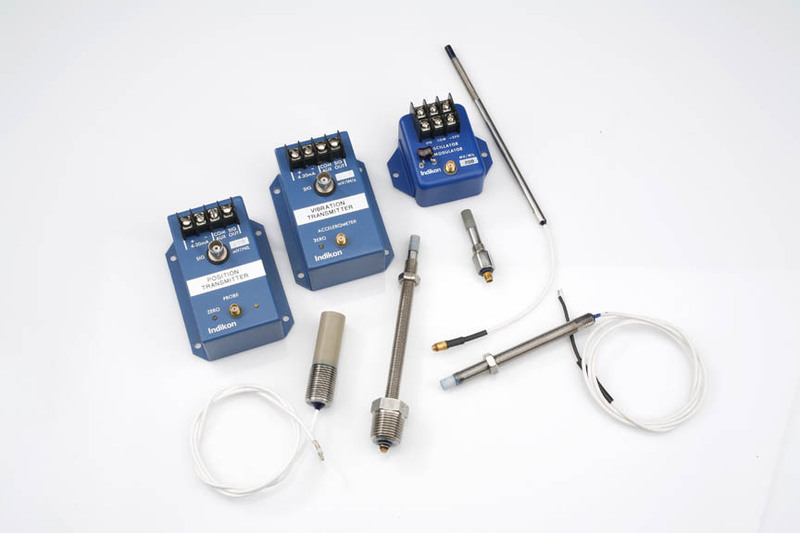 The vibration measuring circuitry has two peak detectors and an RMS detector, so it can measure a value that focuses more on the spikes or the average vibration level. Different software filters can be utilized and configured to best measure and display the vibration level. Data presentation could be changed to match customer preferences. The monitor also includes checks on the functionality of the sensing circuit and the sensor. It can detect and report/display messages if the sensor excitation is not functioning, if there is a wiring break in the primary circuit (black and red wires to the sensor) and if there is a wiring break in the secondary circuit (green and white wires from the sensor). Since the monitor can detect a wiring break, it can provide only an alarm indication if this happens, advising of the situation, rather than ignoring or failing to recognize it or tripping the system. This insures safe operation with minimal down time. An alarm bypass feature could easily be provided, if desired, as a second digital input is available, currently used for the demonstration mode. The monitor is designed for panel mounting and requires an opening. This is the same opening and screw hole arrangement that was used on many older products, including the V/P-T3, VT-11a, and Series 2000 TriLight products. Secure the instrument to the panel with four #8 lock washers and nuts behind the panel. Screws are not needed as the monitor has threaded studs on the back of its front panel. The monitor can be mounted in any standard filler panel. It should be mounted in a control room environment, free from contamination and excessive ambient temperatures. Monitors are designed for a control room environment. Temperatures must not exceed 135°F. Weatherproof doors, air purging, or other means of protection, must be provided where the environment is poor. 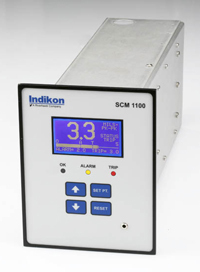 To learn more about Riverhawk’s Indikon SCM1100 Single Channel Vibration Monitor, please contact a member of our team.